You can use the Design Studio to customize your network’s appearance.Â Select a theme, insert your header or background image, have two columns instead of three, change the color of your tabs when you hover over themâ€¦ You can do all of this and more, at the click of a button. 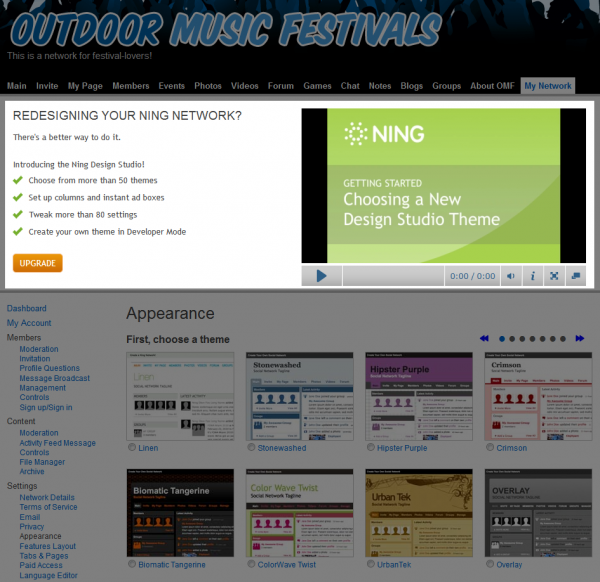 Newer Ning Networks come with the Design Studio already enabled. To enable the Design Studio on a network using the Classic Appearance Editor, head over to your My Network tab, then click the “Appearance” link in the Settings section. Finally, click the “Upgrade” button and publish a new theme. To get started, click on theÂ Design StudioÂ icon at the top left of your network bar. 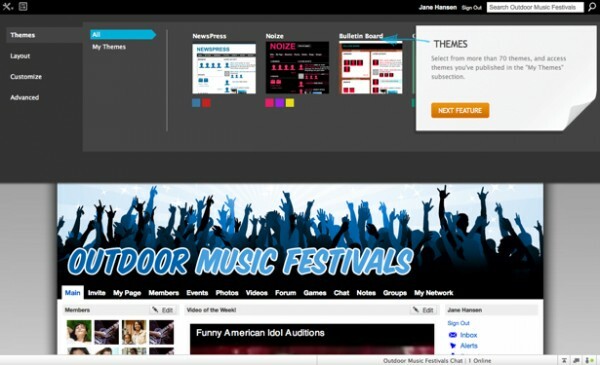 There are four panels to choose from: Themes, Layout, Customize and Advanced. The Themes panel includes a growing collection of themes that can be applied to your network. Clicking on a theme will give you a live preview of what it would look like on your network. This panel also includes up to 50 of your last published themes in the My Themes section. You should also have a “Classic” theme available if you want to revert to the Classic Appearance Editor. The Layout panel provides you with eight different arrangements to apply to your network. TheÂ Customize panel is where you can tweak the details, such as header images, module backgrounds and font styles. If you switch to the Design Studio, then decide you’d rather have your last theme and customizations from the Classic Appearance Editor, just go to My Themes in the Themes panel, click on the Classic theme with the Ning logo and click “Publish”. This will reinstate the structure and customizations you had.Â This will not restore or affect content on the network. 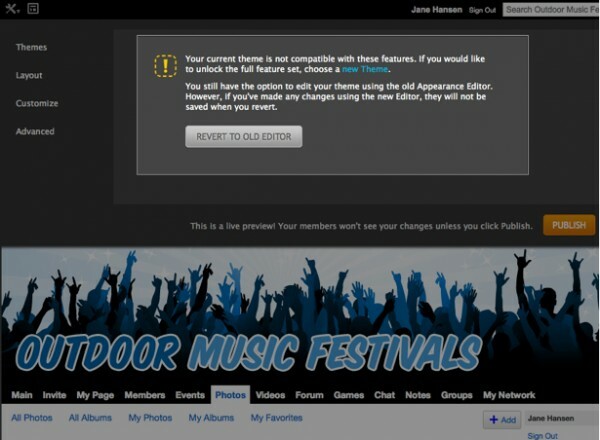 Switching back to the Classic Appearance Editor will also reapply your members’ My Page appearance. If you took the tour, that’s great! Missed the tour? Add this string to your address in the navigation bar to see it again! Please note that switching to the Design Studio will cause the themes and designs you select to be applied to the entire network. 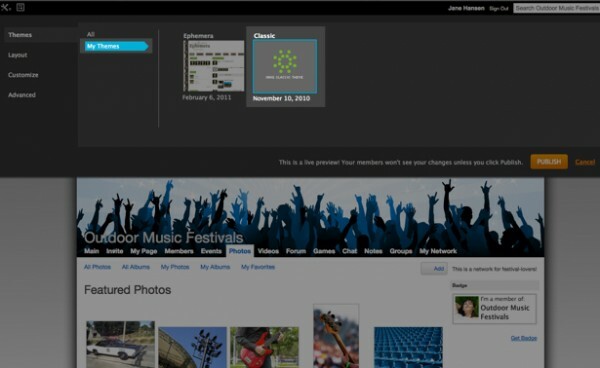 If your members have their own themes and customizations in place on their My Pages, these will be removed.